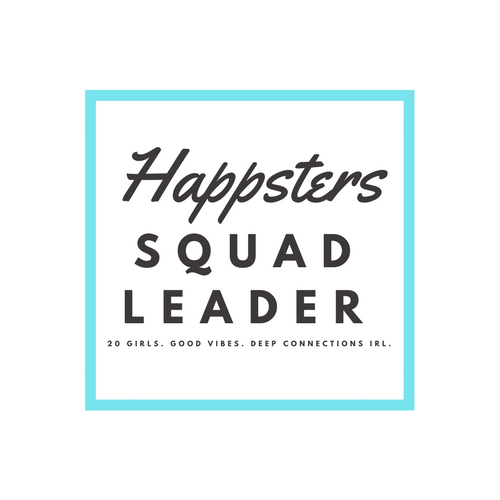 Everything You Need to Know about the Happsters Squad! We are proud to support Girls on the Run International. Girls on the Run 10-week programs encourage positive emotional, social, mental and physical development. Girls from 3rd-8th grade discuss challenges they face at this age and also develop important strategies and skills to help them navigate life experiences. At the end of each three month session, the girls participate in a 5K event, which gives the girls a tangible understanding of the confidence that comes through accomplishment, as well as a framework for setting and achieving life goals. Every Happsters Squad that is created helps fund a scholarship for a middle-school girl to participate in a Girls on the Run 10-week program. Local Happsters Squads work with nearby Girls on the Run Councils to volunteer at their 5K races and offer help in other ways throughout the year. Q: Who runs each city’s Happsters Squad? A: We hand-pick an amazing leader for every city who leads the squad for the year and organizes each event. Q: How are the days/times of the events chosen? A: Once all of the members officially sign up for a squad, they join a private Facebook group where the leader will give a few dates and times for the month for everyone to vote on. All events will be held after normal work hours or on weekends. Q: How do you decide which cities to expand to? A: If you’re interested in joining a squad near you, be sure to fill out the application. We expand to locations where we have a large number of applicants. Expanded my view of what it means to personally connect, engage and build relationships with people in my local community. Given me something amazing to look forward to every single month as well as the opportunity to contribute and be active in the experience. Given me a safe and supportive place to land when things got a little crazy in my life and I needed something consistent and loving and fun to experience to stay grounded when life became chaotic.